*** Now Shipping! *** Order today! Do you drive for Uber? How about Lyft? Perhaps you do rideshare for multiple TNC's? This bundle is for you. Since there isn't an affordable 3CH (front, inside, and rear-facing) all-in-one system out there, we have created this bundle exactly for that purpose, and it's the perfect dashcam setup for Uber, Lyft, Taxi and other fleet/commercial drivers. Why not just go with the DR590W-2CH-IR front and interior recording dashcam? You certainly could, and you would be well-covered when driving rideshare during the day and at night. The addition of the DR590W-1CH for the rear windshield of your vehicle simply adds another camera angle to your dashcam defense system. Since as many as 30% of all traffic accidents in the USA are rear-end collisions *, having a clear rear-facing picture provides that extra level of defense for yourself and your loved ones. 2x Warning/Notification Stickers | "Audio and Video Recording In Progress"
This bundle features BlackVue's mid-range two-channel (dual lens, forward and inside-facing, with infrared nightvision LEDs) dashcam, the DR590W-2CH-IR. The DR590W-2CH-IR could certainly be considered one of the best dashcams for rideshare drivers. If you're unfamiliar with this model dashcam from BlackVue, please click here or on the image below to open the DR590W-2CH-IR dashcam product page. Also included in this bundle is BlackVue's Full HD one-channel dashcam, the DR590W-1CH. If you're unfamiliar with this simple but high-quality single-lens dashcam from BlackVue, please click here or on the image below to open the DR590W-1CH dashcam product page. Free up your cigarette lighter power outlet and easily hardwire the BlackVue DR590W-2CH-IR and DR590W-1CH dashcam in your vehicle. The Power Magic Pro is a control module that allows the BlackVue dashcams to keep "watch" over your vehicle while your car is parked and you are away. The Power Magic Pro will also prevent a dead car battery: should your car battery drop below 12 volts, the camera will be turned off until you return to your vehicle and start your engine. This bundle includes TWO Power Magic Pros: one for the front+inside DR590W-2CH-IR, and one for the rear-facing DR590W-1CH. Each dashcam will plug in to the power outlet provided by one Power Magic Pro. With two Power Magic control modules, you can have independent control of your two different dashcams, for those times when you don't need both systems running when the vehicle is parked. Click here or on the image below to learn more about the Power Magic Pro that is included in the BlackVue "Essentials" Dashcam Bundle. 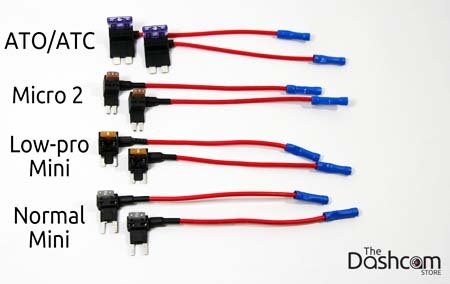 Click here or on the image below to learn more about our simple DC test light (circuit tester) that is included in the BlackVue "Essentials" Dashcam Bundle. 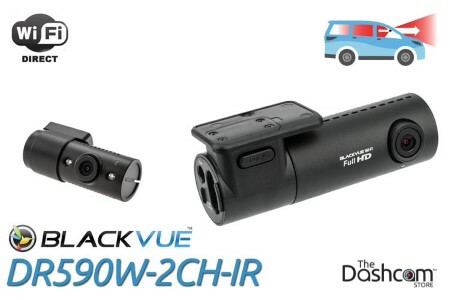 Click here to learn more about our "add-a-circuit" fuse tap bundle that is included in the BlackVue "Essentials" Dashcam Bundle. These simple but effective polarized filters quickly slip over the front and rear-facing lenses of your DR590W 3CH setup. They fit snugly in place, and can easily be removed if necessary. The filters do not need to be adjusted or rotated (they are actually fixed in place); the filters have been calibrated for optimal alignment at the factory. These filters include an anti-UV treatment, as well. Click here or on the image below to learn more about the Polarizing Filters that is suggested for use with the BlackVue "Essentials" Dashcam Bundle. Click here or on the image below to learn more about the Offset Mounting Bracket that is suggested for use with the BlackVue "Essential" Dashcam Bundle. The DR590W-2CH-IR and DR590W-1CH dashcams include a 16, 32, 64, or 128GB BlackVue memory card. While the memory cards are removable and the card slots will accept other brands of memory cards, we strongly suggest the use of only BlackVue memory cards in the BlackVue dashcams, as the use of a non BlackVue memory card may cause performance issues and may void your manufacturer’s warranty. The BlackVue "Essential" Rideshare Bundle includes FREE priority ground shipping within the continental United States. Expedited shipping may be selected during checkout for an additional fee. International shipping is not available on this item, except to Canada or Mexico.